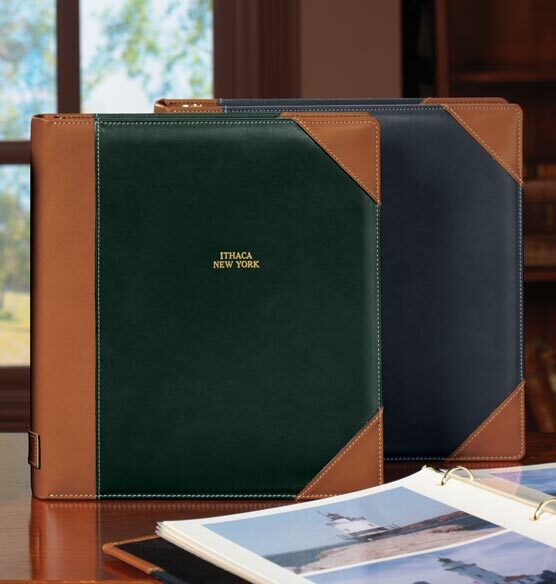 Classic good looks with sporty detailing define this leather Ivy League extra capacity personalized photo album. 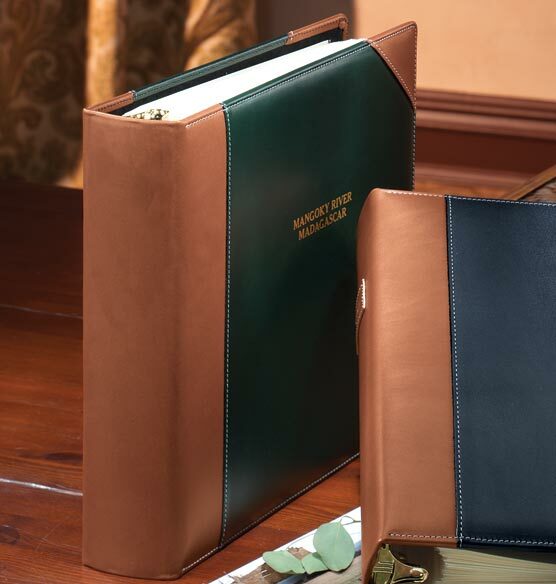 With spines and corners wrapped in saddle tan leather and offset with white top stitching, this is one photo album you will be proud to display. an excellent album,but chose your filler pages carefully! Mine came without any plastic sleeves for the cardboard pages, even though it shows that way! I just bought one of these for my own family photos and probably will buy another because I'm already running out of room, even with the extra capacity. Everything about the album is beautiful, and it feels like it will last a very long time. 1) "D" rings would let the pages lie flatter. 2) It's missing "sheet lifters," which used to be standard equipment in every loose-leaf notebook in the world, even the cheapest. They're the plastic supports that fit onto the rings in front of the first page and behind the back page, to keep those pages from getting crunched in the fold and prevent the rings from digging into the lining. I don't understand why a quality product like this doesn't come with that protection for the lining. 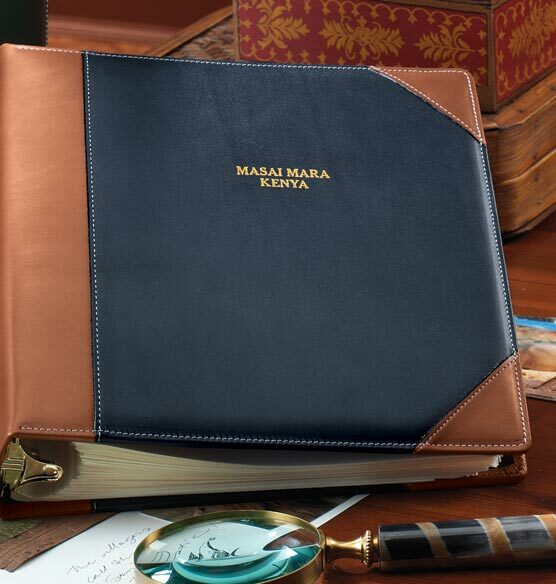 Seems like a small thing to add, but it would undoubtedly guarantee that the album's good looks would last a lot longer. I use one or two of these albums every year. It is a nice way to document family events throughout the years. how do I remove items from the bag list? Why doesn't your web-site work? BEST ANSWER: Thank you for your question. You may update the quantity to 0 and click update, or there is a garbage can icon at the end of each line to remove the whole line. We hope this information will be of help to you. How many pages does it hold? BEST ANSWER: Thank you for your question. 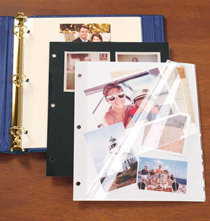 Holds up to 70 – 3-ring photo pages (6-7 sets). We hope this information will be of help to you. how many words per line? BEST ANSWER: Thank you for your question. Up to 3 lines, 20 characters per line. We hope this information will be of help to you. 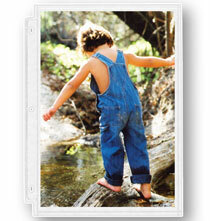 how many 4x6 photos can this hold? BEST ANSWER: Thank you for your question. 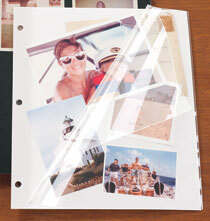 It will depend on the pages that you use for the album. 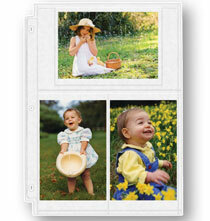 It will hold a max of 420 4x6 photos is you get the 3 photos per side for pages. We hope this information will be of help to you. 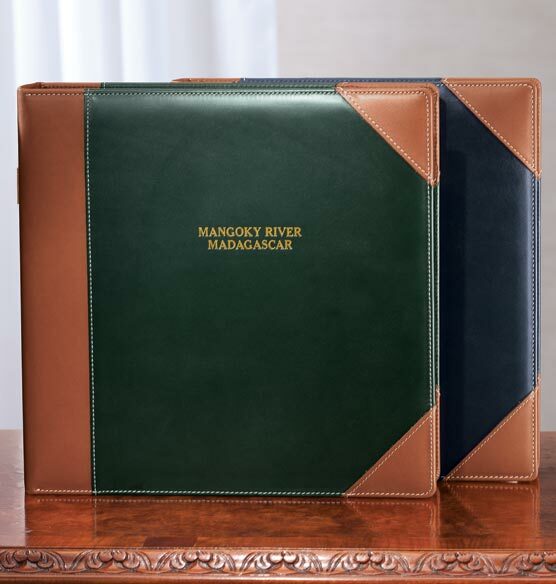 Are album pages #309337 compatible with this Ivy League extra capacity album? BEST ANSWER: Thank you for your question. Yes they are. We hope this information will be of help to you. Are the goldtone rings/hardware expected to last more than 10 years ? BEST ANSWER: I would have to way of knowing this, but I would assume it would depend on how much use the album had. I ordered two for my son - one for college and one for law school. So the only use the rings have had was to organize the photos and materials when I prepared the albums. I would think he wouldn't have much reason to open and close the rings. I had his name and school put on each album, and I think he was very appreciative. He has had them about 6 months. They look very nice, I think.